This is the story of a love affair. The kind of love that makes you wake up with a silly smile stuck on your face and uses your heartstrings to create a beautiful melody. The kind of love that makes you feel warm inside even in a cold breeze. The kind of love that makes you feel at home. 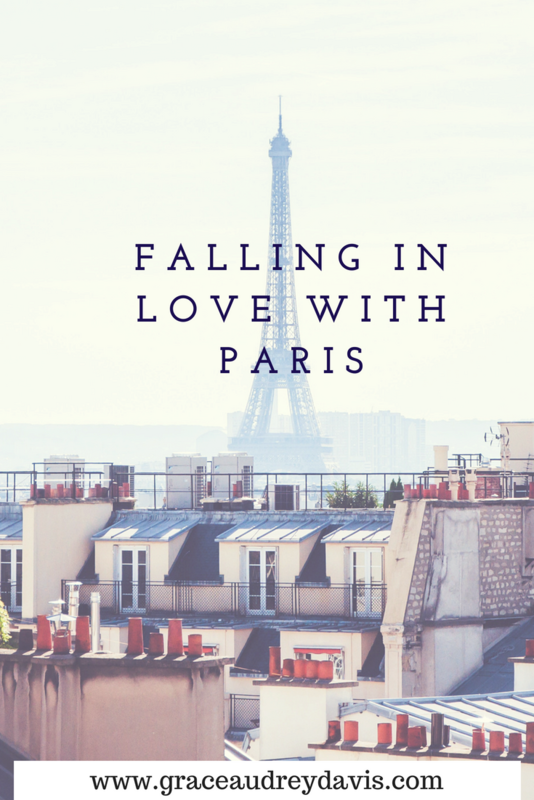 This is the story of how I fell in love with Paris. Maddie and I are the last get off of the train. After the scene we caused while trying to put our suitcases on the top luggage rack, we were in no rush to elbow our way through the crowds and possibly cause injury. Even though it was 9pm, it was still bright outside when we arrived at Paris du Nord. Maddie, one of my best friends from university in Canada, led the way. With her iPhone out and head on the “tourist swivel,” we stuck out. After walking the wrong way for about five minutes, Maddie showed me the screenshot of the map and directions she saved when we had internet. Once I translated the French (not), I realized the directions we were following were from the hotel to the station, rather than the station to the hotel. So, after pulling our suitcases back past the same groups of people, we stood at an intersection for another five minutes trying to decide which of the six streets to walk down. Don’t worry, we managed to keep the awkward ball rolling once we found the hotel 15 minutes later. After a highly confusing check in where the total ended up being a substantially larger number than we expected, the man at reception told us our room number and pointed out the lift. After pressing a couple of buttons, pushing on the doors, and mumbling a profanity or two, we decided to casually walk by reception and lug our suitcases up a couple of flights of stairs. Once we got to our floor and walked down the hallway, we realized that neither of us remembered the room number. “306, was it?” “No, I thought it was 308…” I tried using the key on a couple of doors, but once I heard someone approaching the door from the other side I quickly aborted the mission and took off around the corner. Maddie was forced to go back down to reception and play it cool while asking your man what room we were in. Great start. Finally we left for dinner. Strolling down the streets of Paris made me forget about every mishap we’d had. All of my senses were engaged — the smell of fresh bread, the sight of beautiful stone Parisian buildings, the sounds from the locals wining and dining with trails of cigarette smoke wafting behind them. I was in love with Paris already. I felt as if I had walked into a painting, and I belonged there. We found a cute restaurant with a terrace that was packed with locals. Maddie ordered for us in French from our server, a pretty girl with delicate features, sporting a massive bandage across her nose. Our meals ended up being completely different from what we expected, but we enjoyed every bit of food. We sipped on French chardonnay and devoured a salad that was topped with multiple cheeses, as well as a crusty baguette, and a croque monsieur. The locals surrounding us oozed class. The women all sported longer bobs, natural makeup, and chic style consisting of black rimmed glasses, black jeans and a smart jacket. As for the men — tall, dark and handsome. The cliche must have originated in Paris. This city inspires people. Although it never worked out for us to visit any of the art museums, we were constantly surrounded by art. Besides the physical paintings and photos that were sold on the streets, there were the sculptures outside of the Louvre, the stunning bridges over the Seine river, and the mesmerizing Gothic churches. The architecture is a delicious feast for your eyes — buildings are perfectly symmetrical, clean, and utterly European. It was a little too easy to fall in love with Paris. Picnicking under the Eiffel Tower (#61 on my Before 30) has earned the title as one of the best nights I’ve had since I’ve moved to Europe. 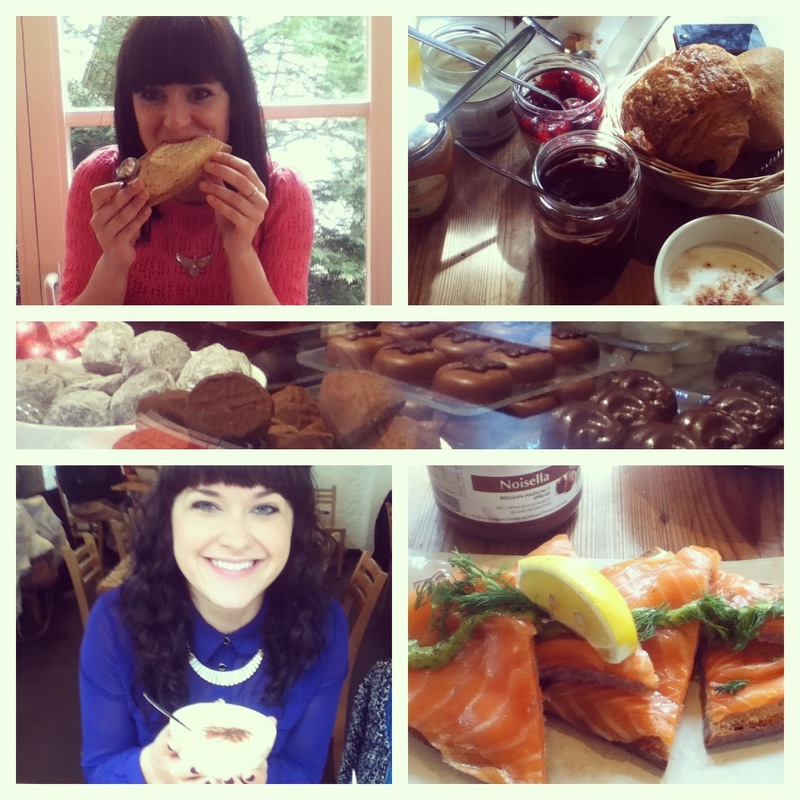 We spent the afternoon wandering around markets, bakeries, and shops till we got the perfect picnic dinner. 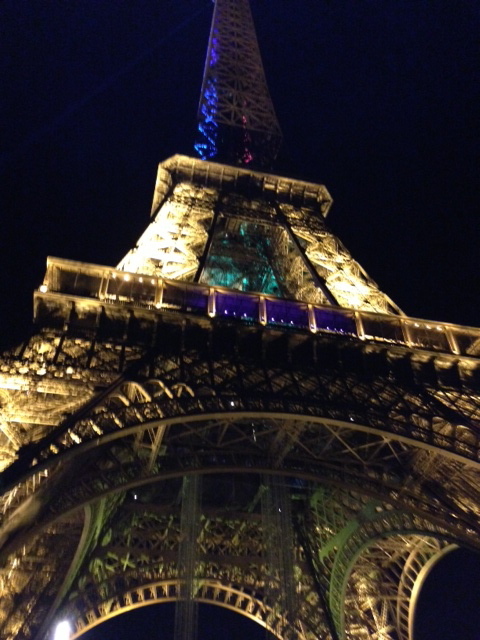 Once we got off of the train, we walked underneath the Eiffel Tower, our feet pounding on the pavement where hundreds, thousands, millions have walked before. One look up and my heart skipped a beat. This is Paris. Up ahead there was a stretch of green grass with people scattered across the lawn. We spread out our towels, set up our smorgasbord, and decided to bust out the wine. I was a little nervous about using the corkscrew we bought at the corner store. It looked simple enough — a metal screw about four inches long with a perpendicular wooden handle at the top. I’ve used enough wine openers to know that the ones with more gadgets (the bigger, more intimidating looking openers) tend to be the easiest ones to us. “Okay, pass me the Sancerre!” I said with an air of confidence. I’ve been a server for six years and drink a good bit of wine in my spare time, I’m practically a pro wine opener. I peel off the foil cover and discover a synthetic cork. Grand. No worry of it breaking to bits. I tilt the tip of the screw and turn the handle until a little bit shows, and pull. Nothing. I put a little more muscle into it. Still nothing. I give it everything I got! Not even a budge. Maddie and I proceeded to pass the bottle back and forth for a good 10 minutes before we decided to try the other bottle. We heaved and pulled and eventually freed the wooden cork from the Chablis. Little bits of cork never tasted so good as it did in that first glass of wine. I may have already fallen in love with Paris, and after the rigamarole I was in love with that wine. We spent the evening under the Tower lights drinking wine, debating philosophy in the homeland of many greats such as Foucault, and eating an obscene amount of French cheese – Camembert on baguette, wrapped in prosciutto, on top of a cherry tomato, and straight up. All of the cheese. I didn’t want to even look at cheese again after that night. 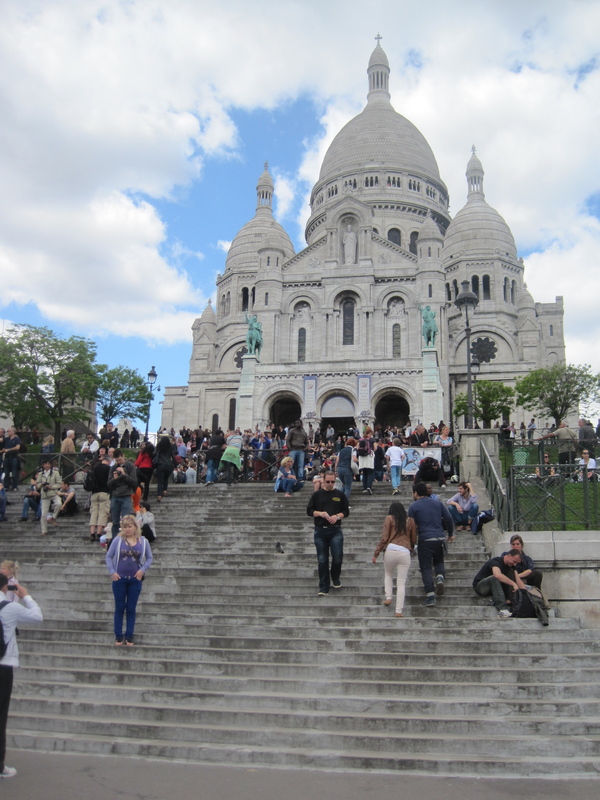 Parisian culture is relaxing, indulgent, and beautiful. I think it’s fair to say that Paris captured my heart, and I don’t plan on asking for it back for awhile. The moment after I just finished saying I wished we had heard more French music, like the accordion. This is the face of a girl in love with Paris! This is the story of a love affair. The kind of love that makes you wake up with a silly smile stuck on your face and uses your heartstrings to create a beautiful melody. The kind of love that makes you feel warm inside even in a cold breeze. The kind of love that makes you feel at home. This is the story of how I fell love with Paris. Parisian buildings, the sounds from the locals wining and dining with trails of cigarette smoke wafting behind them. I felt as if I had walked into a painting, and I belonged there. We found a cute restaurant with a terrace that was packed with locals. Maddie ordered for us in French from our server, a pretty girl with delicate features, sporting a massive bandage across her nose… (Nose job?) Our meals ended up being completely different from what we expected, but we enjoyed every bit of food. We sipped on French chardonnay and devoured a salad that was topped with multiple cheeses, as well as a crusty baguette, and a croque monsieur. This city inspires people. Although it never worked out for us to visit any of the art museums, we were constantly surrounded by art. Besides the physical paintings and photos that were sold on the streets, there were the sculptures outside of the Louvre, the stunning bridges over the Seine river, and the mesmerizing Gothic churches. The architecture is a delicious feast for your eyes — buildings are perfectly symmetrical, clean, and utterly European. I was a little nervous about using the corkscrew we bought at the corner store. It looked simple enough — s metal screw about four inches long with a perpendicular wooden handle at the top. I’ve used enough wine openers to know that the ones with more gadgets (the bigger, more intimidating looking openers) tend to be the easiest ones to us. “Okay, pass me the Sancerre!” I said with an air of confidence. I’ve been a server for six years and drink a good bit of wine in my spare time, I’m practically a pro wine opener. I peel off the foil cover and discover a synthetic cork. Grand. No worry of it breaking to bits. I tilt the tip of the screw and turn the handle until a little bit shows, and pull. Nothing. I put a little more muscle into it. Still nothing. I give it everything I got! Not even a budge. Maddie and I proceeded to pass the bottle back and forth for a good 10 minutes before we decided to try the other bottle. We heaved and pulled and eventually freed the wooden cork from the Chablis. Little bits of cork never tasted so good as the first glass of wine. The moment after I just finished saying I wished we had heard more French music, like the accordion. Green leaves, pink blossoms, and flowering vines dancing across stone hedges. It’s time to visit the best parks in Dublin. It’s been a very long winter. I spent so much time feeling cold that my only wish was for summer to arrive so I could finally warm up. I forgot about spring, the season that spoils us with beautiful growth and teases us with anticipation for great things. The city is lit up in colour with flowers blooming in gardens, pots and trees. I also love the rogue wild flowers scattered across the grass where they shouldn’t be. I need to give myself extra time to walk everywhere because I always get distracted and smell the flowers. My latest addition to the soundtrack of my life is “Flowers in your hair” by the Lumineers since I’m constantly sticking flowers into my curls while humming the tune. One of my favourite pass times is hanging out in a park, drinking coffee while sitting on a bench or journaling with my back against a tree. Here’s an inside scoop on the parks I frequent in Dublin. Yes, given its location right next to Grafton street it’s almost always bustling, but it’s still a park worth visiting. There are ducks and swans swimming in the pond, plenty of flower beds, benches, and a beautiful small bridge. There are also a few trees that have a PERFECT cove for you to nestle into. I love to grab a hot chocolate from Butler’s on Grafton Street and then relax in the park for a few minutes. There’s a beautiful park just off of Long Lane, hidden away from the chaotic bars on Camden Street. It’s much quieter and smaller than Stephen’s Green, which makes it a great place to read a book. At this time of year the pink blossom trees are in their full glory and there are tulips and other flowers for you to enjoy. On the small side but I think it’s one of the best parks in Dublin. Yesterday I discovered my new favourite park while getting lost looking for a gym that I’m sure doesn’t exist. As soon as I walked in I fell in love with it. It made me want a picnic immediately. It’s quiet, has great trees, and is full of tranquility. It is the perfect place to have a peaceful picnic while the day drifts away. A stones throw from Stephens Green, this big city centre park is much less touristy. A great spot to have a picnic or just chill while you’re on your break from work, this park is a locals delight. 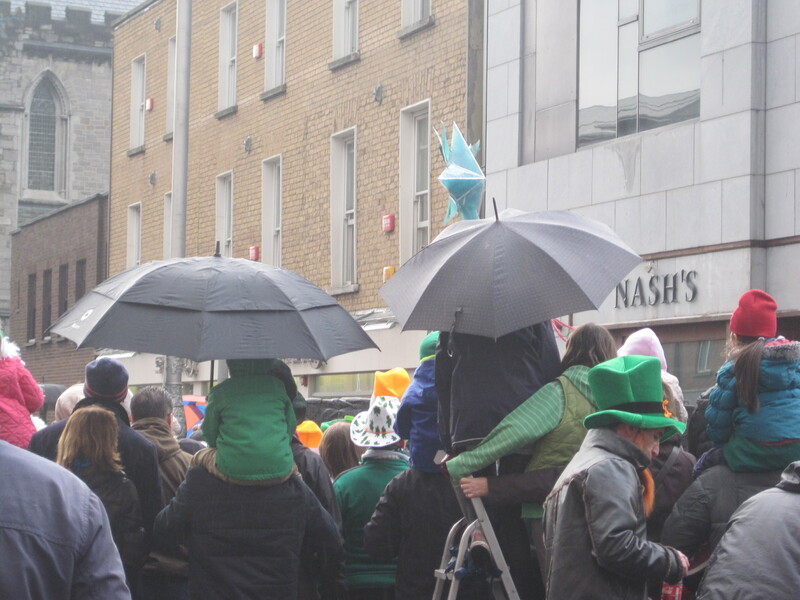 It’s also the location of many city festivals such as Taste of Dublin and summer concerts. Easily one of the best parks in Dublin. Spring puts joy in my heart, a lightness in my step, and flowers in my hair. It’s a good season. Even the vines climbing sidewalk hedges deserve some attention. Interested in Dublin? Check out my post on How to Become a Dublin Local in Under a Week. Green leaves, pink blossoms, and flowering vines dancing across stone hedges. Dublin, spring looks good on you. Yes, given its location right next to Grafton street it’s almost always bustling, but it’s still a park worth visiting. There are ducks and swans swimming in the pond, plenty of flower beds, benches, and a beautiful small bridge. There are also a few trees that have a PERFECT cove for you to nestle into. I love to grab a soya cap from Butler’s on Grafton Street and then relax in the park for a few minutes. There’s a beautiful park just off of Long Lane, close to Camden Street, but I’m not sure what it’s called. 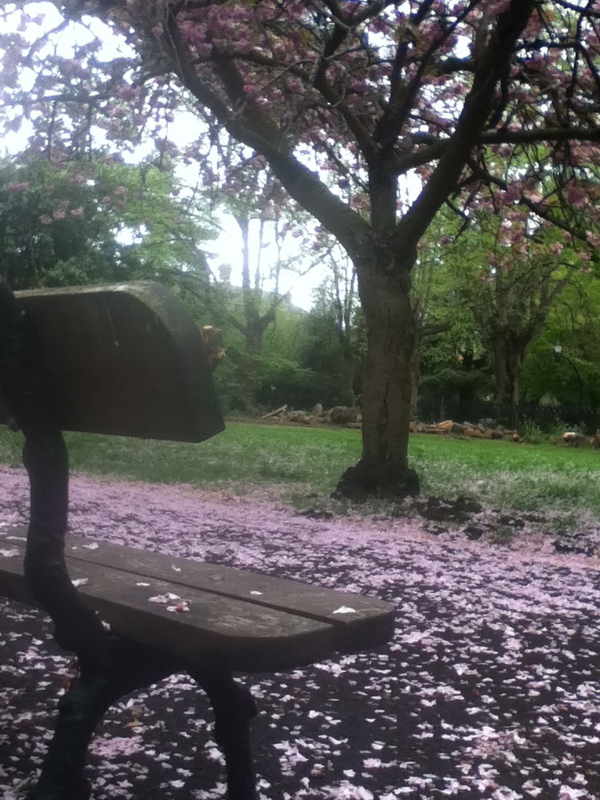 It’s much quieter and smaller than Stephen’s Green, which makes it a great place to read a book. At this time of year the pink blossom trees are in their full glory and there are tulips and other flowers for you to enjoy. I got the waffle from a waffle truck. The breeze carried the sweet smell of the dough, enticing me to find the truck and take a break from getting lost in Brussels. We ordered two waffles, each with a scoop of creamy vanilla ice cream and a drizzle of Belgian chocolate. We sat at the top of a set of stairs overlooking a park nestled in front of city landscapes. With the sun on my face and the soft sound of French style accordion music from a busker, I had the perfect setting for indulging in my first Belgian waffle. One bite of the dense, sugary waffle and I was ruined for any future non-Belgian waffle. It was the best pastry I’ve ever had, and the ice cream and chocolate made the treat all the more delectable. There’s a reason why Belgian waffles are famous. I booked a trip to Brussels on a whim. There was a Ryanair sale so one day my friend and I sat down and booked three random trips. #44 on my Before 30 list (eat chocolate in Belgium) was reason enough to buy a 40 euro flight. When we told people we were going to Brussels, a lot of our friends told us negative stories about their experiences in Belgium. I had a gut feeling I would still like Brussels, and I was right. Brussels is beautiful in so many ways – beautiful architecture, beautiful food, BEAUTIFUL men. I love Brussels. Our flight was early Monday morning, which proved to be problematic because we had a friends farewell party Sunday night. Service industry staff tend to stay out late, so I opted for a no sleep option. After we hit up a couple of bars and had a little after party with some peanut butter toast, I went home, packed, showered, and grabbed a taxi to the airport as the sun rose. What seemed like a good idea at the time quickly became slightly miserable. After catching a bus to a massive train station we had to find a tram to take us to the hostel. Combine extreme exhaustion, a pending hangover, and a complicated foreign language station and you can imagine how difficult it was for us to find our tram. We spent a lot of time looking pathetic which gave the Belgian people a chance to show us how nice they are. Multiple people asked us if we needed help and one person even walked us to the area we needed. The transit system in Brussels is very good once you figure out how it works, and even though all of the signs weren’t in English, we found it easy to find people that speak English. After a much needed two hour snooze, we wandered around the city. We took the tram to Louise Station, an upscale area with storefronts sporting labels such as Versace and Vera Wang. As we waited for my friend Julie (who I lived with in Gold Coast and now lives in Brussels,) we had a chance to people watch. Brussels is very, very different from Dublin. From the areas we explored in the city centre, we found it to be a more peaceful city than Dublin. People speak more softly, everyone seems relaxed, and people have great style. Even our taxi driver looked like he could have been in a stylish magazine for casual day wear. known for its chocolate, beer, waffles and frites you’d expect to find an overweight population. We found the opposite to be true — on average people were healthy looking. Oh, and did I mention attractive? From my perspective, this city is doing its part with maintaining the tall, dark and handsome stereotype. 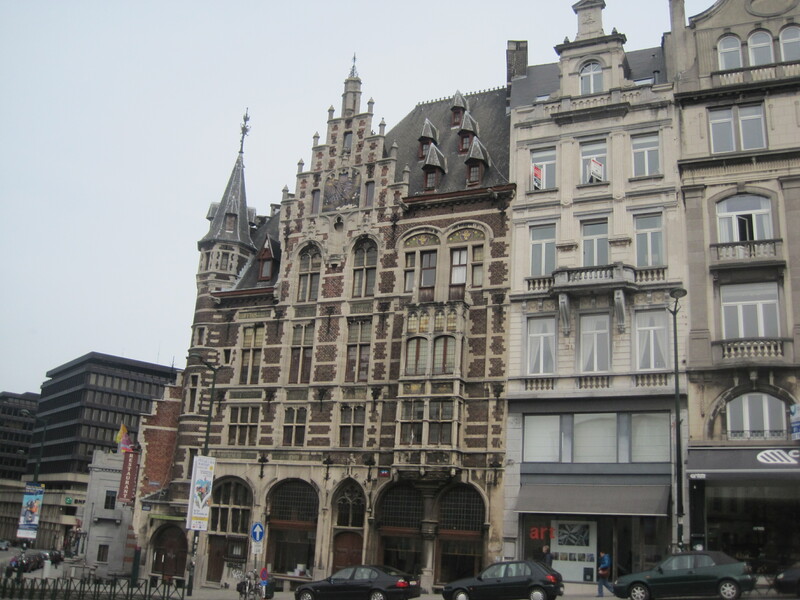 Brussels is small enough that we were able to see most of the city centre landmarks on foot. We spent the day getting lost and stumbling upon gorgeous buildings and sculptures. We ate beautiful French food and visited multiple chocolate shops, and let’s just say I crossed #44 off my list several times that day. We also visited Delirium Cafe and tasted a few delicious fruit beers. Kriek is a cherry beer, and it is unbelievably delicious. My friend Iza hates beer, so much so that she had never even had a full beer and she’s in her 20s. She had two glasses of Kriek! Delirium had many beers to choose from, but you either had to choose from the menu or ask the bartender for a recommendation because the taps were blank. Normally beer is advertised on bar taps, and brands want the best display possible (for example, it’s best to be on the end of bar rather than nestled into the middle). The way Delirium is set up is a better experience for the consumer because if you’re chatting with the bartender or looking through the menu you’re more likely to pick a product that suits you rather than just choosing a pint of Heineken because it’s the first thing you see. In Belgium there is also a wide range of glass wear to pair with each beer and they pull pints differently. If you like beer, you’d be in heaven, and even if you don’t like beer I think there was something for everyone. 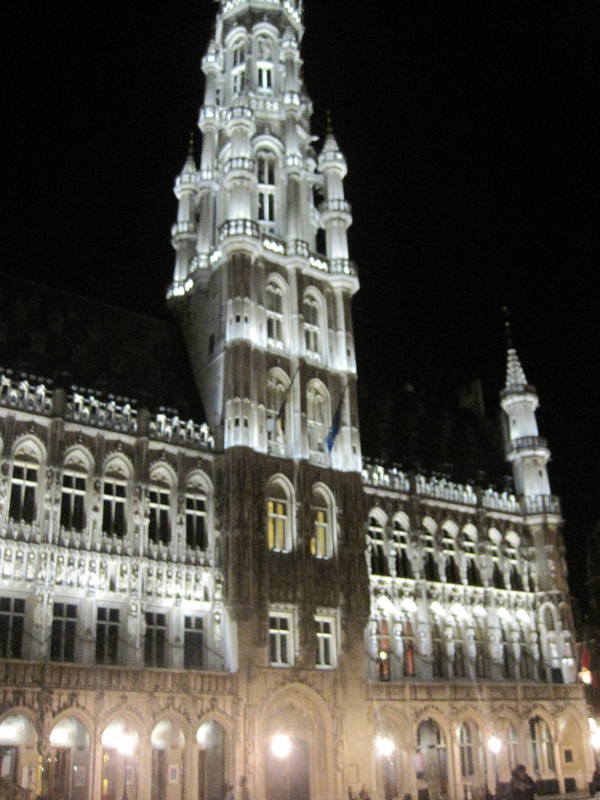 I loved Brussels, not because it’s a flashy, but because it’s quality. It’s been added to my list of dream cities to live in, and even inspired me to add something new to my Before 30 list — #97. Learn French. Brussels is the capital of the European Union. Coconut beer served in a wooden bowl! Delicious. I got the waffle from a waffle truck. The breeze carried the sweet smell of the dough, enticing me to find the truck and take a break from getting lost in Brussels. We ordered two waffles, each with a scoop of creamy vanilla ice cream and a drizzle of Belgian chocolate. We sat at the top of a set of stairs overlooking a park nestled in front of city landscapes. With the sun on my face and the soft sound of French style accordion music from a busker, I had the perfect setting for indulging in my first Belgian waffle. One bite of the dense, sugary waffle and I was ruined for any future non-Belgian waffle. It was the best pastry I’ve ever had, and the ice cream and chocolate made the treat all the more delectable. There’s a reason why Belgian waffles are famous. Iza with her cherry beer! #44: Eat chocolate in Belgium. I crossed something off my Before 30 list this week. #76 Celebrate St. Patrick’s Day in Dublin. 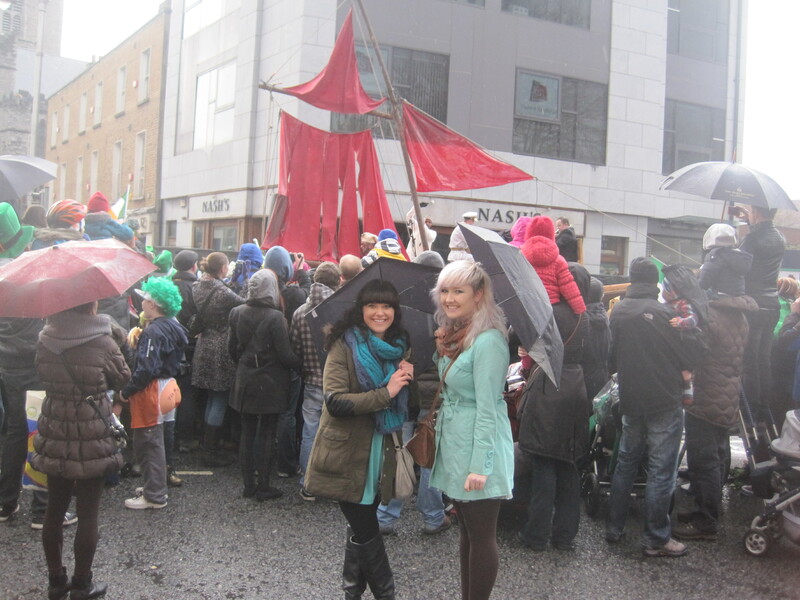 My friend Louise and I hanging out by St Patrick’s Cathedral for the parade. Ireland is a small country with big history. According to Google, Ireland’s population is sitting at 4,487,000 and the size of the country is 84,421 km². To give you some perspective, Canada’s population is 34,482,779 and the size of the country is 9,985,000 km². Ontario, a single Canadian province, has a population of 12,851,821 (2011) and is 1,076,395 km². It would take me longer to drive from my hometown to my university (which were both in Ontario) than it would for me to drive from one end of Ireland to the other. Even though Ireland is relatively small, Saint Patrick’s Day reminds us of how big of a presence Ireland has on the world stage. 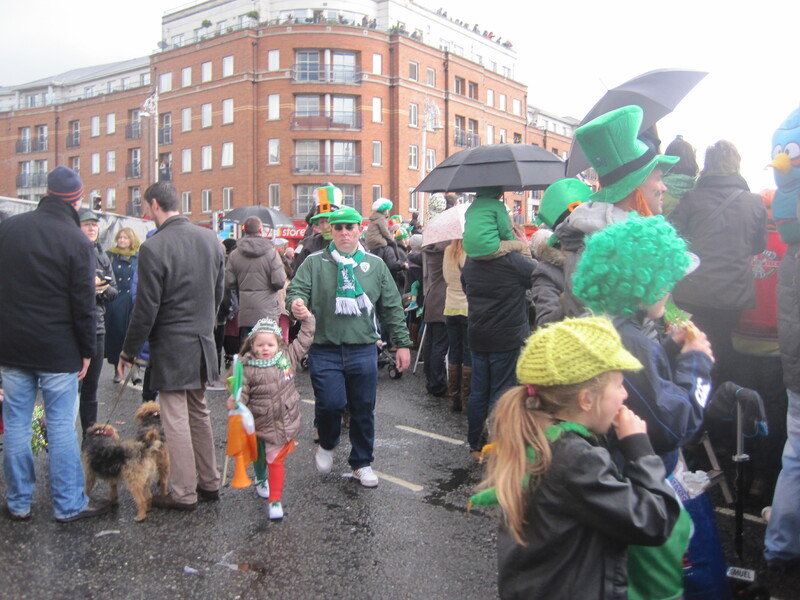 There is something about this culture that makes everyone wants to be at least a little bit Irish. Saint Patrick’s Day is celebrated in more countries than any other national holiday. Saint Patrick’s day, a religious fest, was first celebrated in a quiet fashion in Ireland around 500 years after the saint’s death (March 17, 460, 461 or maybe 493) (The Little Big Book of Ireland). In 1903, it became a public holiday in Ireland, and pubs were ordered by law to remain closed. Since the law has been abolished in the 1970s, it seems there is a lot more drinking than feasting happening on the holiday. I missed the ladder memo. the floats and the occasional flag waved from a marching band. People get there extremely early to stake out the prime real estate and some individuals go so far as to bring ladders to climb and perch on. Everyone was decked out in green, orange and white and the giddy children running around in the rain with their faces painted were adorable. I wanted to avoid Temple Bar because I knew it was jammed with tourists so my friend and I checked out a pub on Thomas Street that was filled with locals. I can’t believe it was the first time I had an Irish coffee because that drink is designed for me — black coffee, whiskey, and topped with cream. Delicious. There were some older people sitting around playing some trad music and everyone sang along, making it a very cozy atmosphere. I don’t have many crazy stories from Paddy’s Day, so I figured I’d take this opportunity to reflect on a few of my favourite Irish things. Music: I LOVE how much of a role music plays in the Irish culture. Anytime I’m in a room where everyone is singing along to an old Irish tune I have a big silly smile pasted on my face. Everyone knows the words to these songs! Ireland is a perfect representation of how music brings people together, and I love it. Beauty: When I get out of Dublin and drive through Irish countryside I feel like I’m in a movie. The stone hedges, rolling green hills spotted with fluffy sheep, and trees reflected in shining lakes take my breath away. I will never tire of this country’s beauty. History: It’s hard for me to comprehend how much older Ireland is than Canada. There is so much history rooted in this country it overwhelms and challenges my mind. Whiskey: I was never interested in whiskey before moving to Ireland, and now I fully appreciate the culture around it. I’m really into wine so it just makes sense that I’d appreciate whiskey tasting as well. I LOVE YOU IRISH COFFEE! I made some Bailey’s Irish Cream cupcakes in honor of Paddy’s Day. delish. Note to self: St Patrick’s Day is March 17. After making the mistake of booking (and consequently cancelling) a cheap flight to Edinburgh on March 17, I’ll never forget international drinking day again.